Eleven (11) Rev. 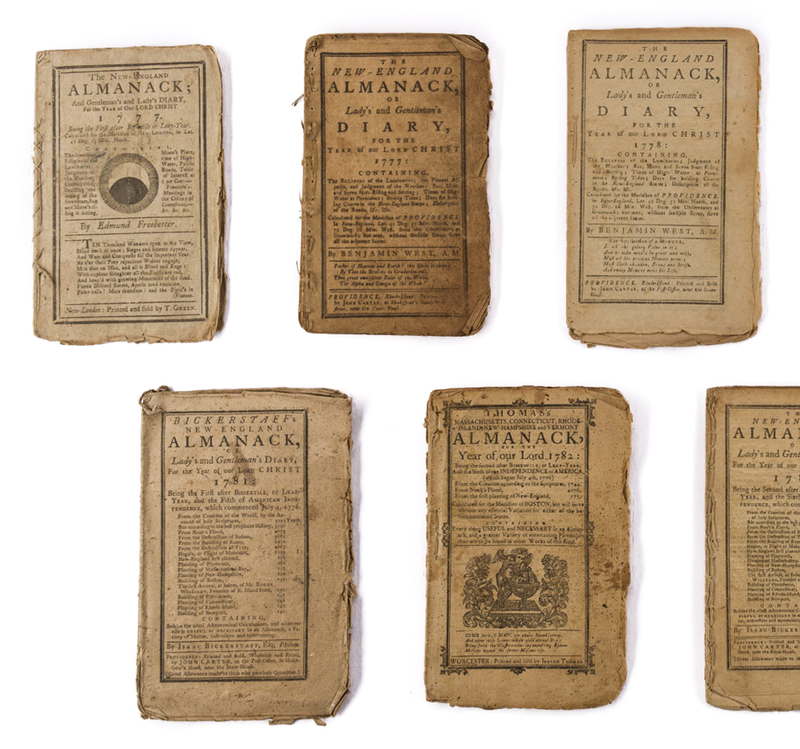 War Era Almanacs, including West, Stafford, George. Octavo, self wrappers, stitched, approx. 22-24 double-sided pages. 1st-2nd items: THE NEW-ENGLAND ALMANACK, OR LADY'S AND GENTLEMAN'S DIARY, FOR THE YEAR(S) OF OUR LORD CHRIST 1777 AND 1778 by Benjamin West (1730-1813), printed and sold by John Carter, Providence. 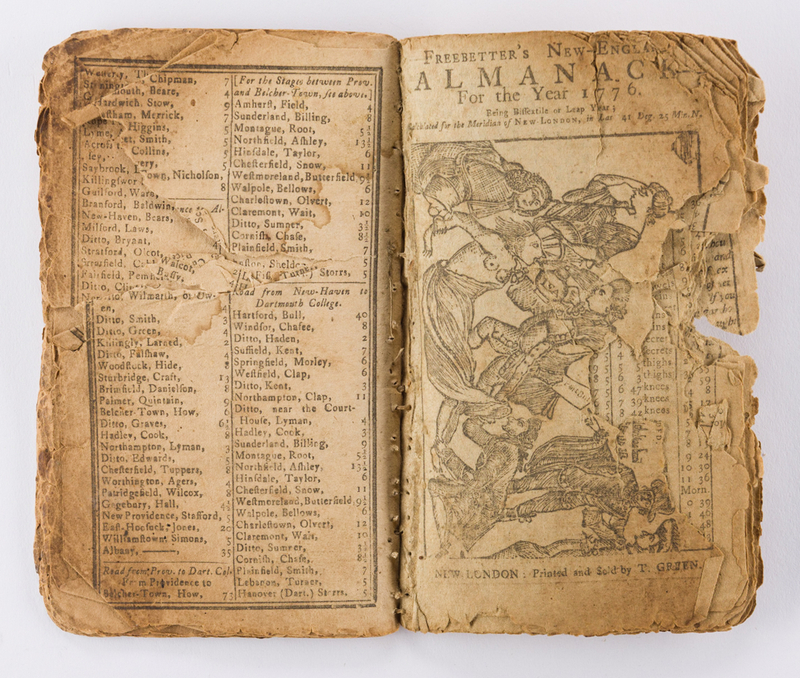 1777 edition includes 23 double sided pages of FREEBETTER'S NEW-ENGLAND ALMANACK FOR THE YEAR 1776, featuring a woodcut reprint of The Able Doctor, or America Swallowing the Bitter Draught satirical cartoon on the fragmentary front leaf. 6 3/4" H x 4 1/2" W. 3rd-4th items: STAFFORD'S CONNECTICUT ALMANACK, FOR THE YEAR OF OUR LORD, 1779 and STAFFORD'S ALMANACK, FOR THE YEAR OF OUR LORD, 1784 by Nehemiah Strong (1729-1807) under the pseudonym Hosea Stafford, printed and (s)old by Thomas and Samuel Green, New Haven. Almanacks approx. 7" H x 4 1/4" W. 5th item: AN ALMANACK FOR THE YEAR OF OUR LORD 1783 by Daniel George (fl. 1776-1787), printed and sold by John Mycall, Newbury-Port. 7 1/2" H x 4 3/4" W. 6th item: AN ASTRONOMICAL DIARY, OR ALMANACK, FOR THE YEAR OF CHRISTIAN AERA 1780 by Dr. Nathanael Low (1740-1808), printed by John Gill and T. and J. Fleet, Boston. Includes woodcut of A Type of a Lunar Eclipse, November 11, 1780, on title leaf with Eclipses for the Year 1780, on the following page. 6 3/4" H x 4 1/2" W. 7th item: THE NEW-ENGLAND ALMANACK; AND GENTLEMAN'S AND LADY'S DIARY, FOR THE YEAR OF OUR LORD CHRIST 1777 by Nathan Daboll (1750-1818) under the pseudonym Edmund Freebetter, printed and sold by Thomas Green, New-London. 6 3/4" H x 4 3/8" W. 8th-9th items: THOMAS'S MA(S)(S)ACHU(S)ETTS, NEW-HAMP(S)HIRE AND CONNECTICUT ALMANACK, FOR THE YEAR OF OUR LORD CHRI(S)T 1781 and THOMAS'S MASSACHUSETTS, CONNECTICUT , RHODE-ISLAND, NEW-HAMPSHIRE, AND VERMONT ALMANACK, FOR THE YEAR OF OUR LORD 1782 written, printed, and (sold) by Isaiah Thomas (1749-1831), Worchester. Almanacks approx. 7" H x 4 1/2" W. 10th-11th items: BICKERSTAFF'S NEW-ENGLAND ALMANACK, OR, LADY'S AND GENTLEMAN'S DIARY, FOR THE YEAR OF OUR LORD CHRIST 1781 and THE NEW-ENGLAND ALMANACK, OR, LADY'S AND GENTLEMAN'S DIARY, FOR THE YEAR OF OUR LORD CHRIST 1782 possibly by Nathan Daboll (1750-1818) under the common pseudonym Isaac Bickerstaff, E(s)q., printed and sold by John Carter, Providence. Almanacks approx. 7 1/4" H x 4 3/4" W. Private Knoxville, TN collection. CONDITION: Overall good condition. Toning, dampstaining, foxing spots, personal inscriptions, ink spots, tears, to be expected from age. 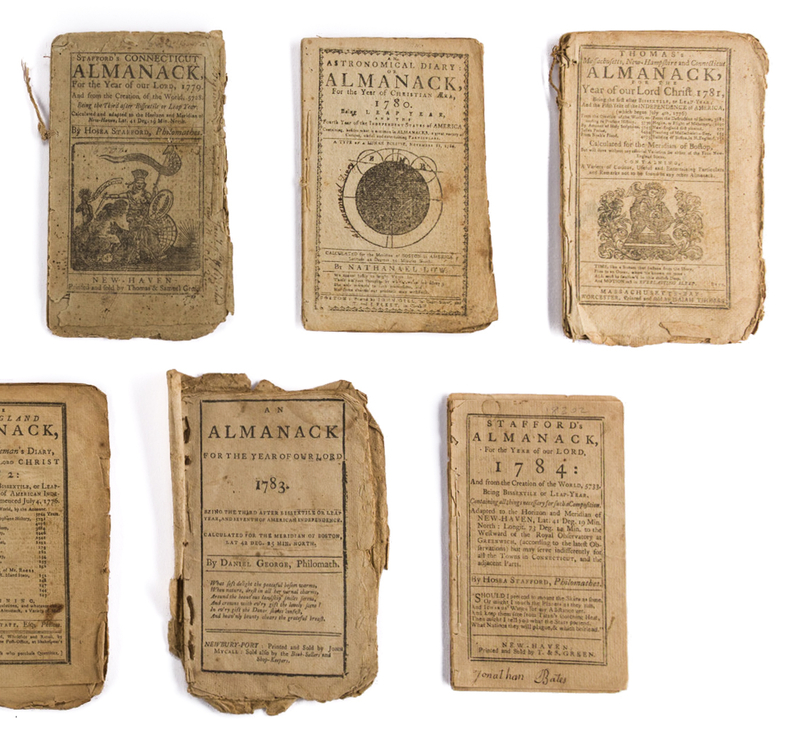 Almanacks intact apart from few exceptions, see following condition reports. 1st-2nd items: November calendar page to final leaf in torn condition, Freebetter leaves in torn, fragmentary condition, majority of woodcut visible, 5" x 2" tear, right edge, 1777 edition. Majority of stitching missing, leaves otherwise intact, 1778 edition. 3rd-4th items: Lower portion of stitching missing, 1779 edition. Last two leaves separated from otherwise intact stitching, old masking tape repairs, left edges of loose leaves, 1784 edition. 5th item: Old addition of front and final covers with brown stitching, stitching otherwise intact with original and added brown stitching. 6th item: Top and lower portions of stitching missing. 7th item: 5 1/2" tear, fourth to last leaf. Small top and lower portions of stitching missing, otherwise intact. 8th-9th items: Top and lower portions of stitching loose or missing, otherwise intact, both editions. 10th-11th items: All original stitching missing, old cord repair, top of spine, pages otherwise intact, 1781 edition. All stitching and pages intact, 1782 edition.